Stephen A. Schwarzman Building in Midtown. MIDTOWN — It's time to brush up on your speed reading. Beginning Sept. 7, public libraries across the city will reduce their hours in an attempt to close a $10 million budget gap, library officials said in a statement. Many libraries will be opening their doors an hour later and closing their doors an hour earlier several days of the week. The changes will reduce hours, on average, by an estimated 11 percent, according to the New York Public Library. Nearly 100 workers have also been laid off through a combination of "voluntary separation" and early retirement, the library said. Officials decided which locations to cut based on their popularity and their proximity to other branches. The goal, they said, was to minimize the impact as much as possible. 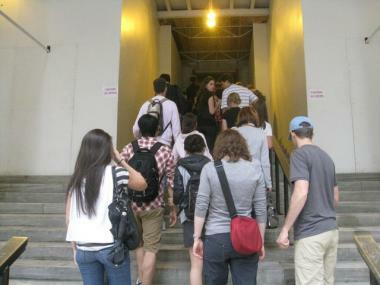 A crowd files into the public library's Stephen A. Schwarzman midtown branch as it opens its doors Tuesday morning. 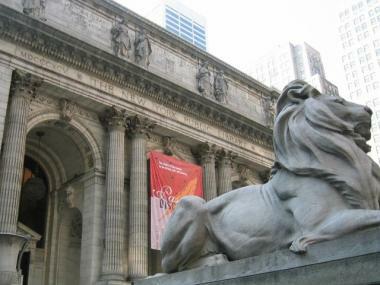 "Unfortunately, the reality is that difficult choices had to be made, and many branches will operate with very limited staffing," NYPL President and CEO Paul LeClerc said in a statement. "We ask the public — which fought so persistently and passionately earlier this year against even greater budget cuts — to be patient with us as we work through these issues." A full list of the revised schedules is available here. The cost-cutting move was chosen as an alternative to eliminating full days of service, which had originally been on the table. An earlier version of the budget would have slashed library spending by a whopping 17 percent, forcing libraries to eliminate 6-day service at most of its branches and lay off hundreds, the Daily News reported. But some libraries are winning out in the change-ups. The main Fifth Avenue brance, for instance, will add new Sunday hours from 1 p.m. to 5 p.m. to make up for closing an hour earlier on Tuesday and Wednesday evenings. 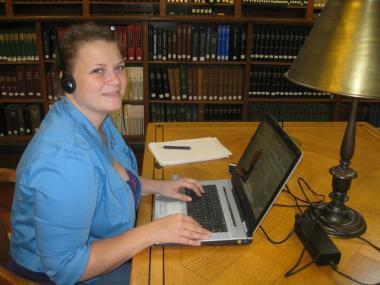 Line Bjerrisgaard, 28, a PhD student who lives in Inwood and comes to the branch to work every day said getting to use the library on Sundays is a huge bonus. Line Bjerrisgaard, 28, a PhD student who lives in Inwood, said she is thrilled the branch has not lost its Sunday hours. "I like getting out of the house. It's important," she said. But most feel the changing hours across the city will be a huge adjustment. "It's a big inconvenience," said Sandra Elstein, 74, from Connecticut, who travels to do research at city libraries twice a week. "Opening early is really important to me," she said. Bronx resident Jacob Adams, 71, who has been conducting research at the Midtown branch every day for the past eight years as he studies to become a Rabbi said he wishes there was some way to preserve the extended hours city-wide. "There's nobody to find some money to help us?" he asked.